This is hilarious. Keeping with the theme of my blog, I wondered if Katy Perry was really born Katy or is it a nickname? Turns out, she was born Katheryn Elizabeth Hudson (Source: http://en.wikipedia.org/wiki/Katy_Perry) and uses the stage name Katy Perry to avoid confusion with Kate Hudson. Perry is her mother’s maiden name. When I was a kid in school, there might be more than one Amanda, Sarah, or Jessica in class, and every Matt in college seemed to have a nickname because there were so many. My parents (born in the 50s) talk about all the Marys, Johns and James in their classes. Nowadays, people say “don’t name your kid Madison or Madelyn, there will be 5 Maddie’s in one class alone” but is that really true? Seems like there is more of a variety of names today which would mean that giving your kid a popular name would mean they might not have to contend with being Olivia K. instead of just “Olivia” too often. Looking at data from the SSA, which releases all the baby names assigned since 1880 (as long as it occurred at least 5 times in a year), it would appear my hypothesis is true. Of course, this data set is lumping all names assigned across the entire US, so fortunately they do release data per state, which shows that certain states, especially western ones like Wyoming and Nevada, have much fewer distinct names. I would guess this has to do with them being less populated and less diverse. States like New York had a greater variety and I even noticed many Jewish-sounding names in the list. I read here that Utahns tend to be extra creative, perhaps to help their kids stand out in a culture of super-size polygamous families. I nodded my head when I read this, thinking of the Brown family on Sister Wives– they’ve got 17ish kids with names like Mykelti, Aspyn, Dayton and Paedon. In the end, naming your kid Olivia might mean that in many areas, they will be the only one in their class, but in other areas they might have to take on their last initial. 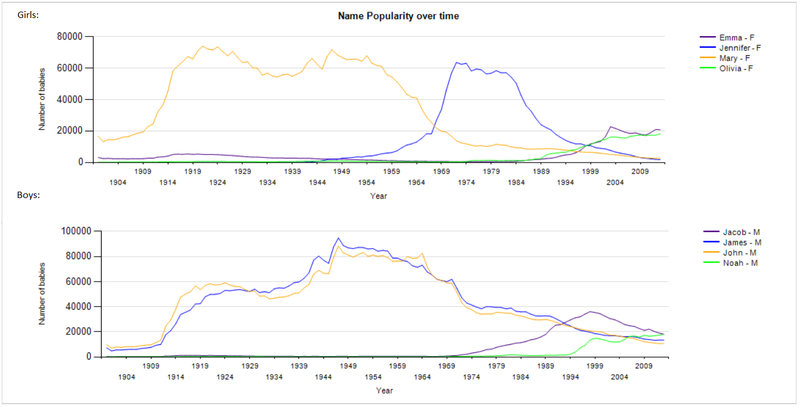 The graphs above show how popular names today are not as popular as you would think. In each, I compare two of the most popular names of 2013 compared to two extremely common names in the past. I cannot believe how popular Mary was and how little the Olivia and Emma lines are next to it! Note that I picked names with fewer spelling varieties to make this as accurate as possible, like Emma is usually spelled Emma, whereas Sophia can also be spelled Sofia. People back in the day were not as creative with how they spelled names. Grouping names together by similar spellings is something I’m still working on (it’s somewhat of a manual process). It’s also crazy how many boys were named John or James. Over 94,000 named James in 1947! Approximately 11.5% of all boys in 1947 were either John or James! No wonder my dad, James, had nicknames growing up, whether it being something like Jay or Jim or a nickname based off of his last name. This chart shows the number of births in the US per year. Interesting to see the baby boom in the 1950s and early 60s visualized here and how the number of babies born today is about the same as the baby boom peak- was not expecting that (thought there would be a higher number of births). In 1961, nearly 4.26 million babies were born. In 2009, there were 4.13 million births. This graph helps me feel semi-comfortable about making name trend graphs by using count of babies born, rather than percentage; for example, if the number of babies born now was twice as high as several decades ago, then that would not be very accurate. Nov 21, 2014 marks the beginning of my blog. It’s actually November 20, but it’s past midnight, which is a sign I should not be putting together a fabulous post, but going to bed. I plan to use this site to post fun data graphs and analysis I’ve done, but also mix in some posts about some of my favorite topics- tennis, snowboarding, documentaries, theology, etc. I love when I come across interesting things when querying databases and wanted a place to share them with others. I work as a software and database developer and love working with SQL Server, SSIS, SSRS, and database and visualization tools. I also have several years’ experience as a .Net developer.